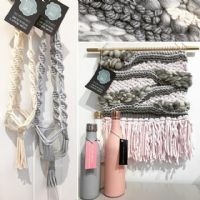 Karolina is a textile artist who is passionate about interior design and home décor and specialises in woven tapestries and macramé wall hangings. She is inspired by nature and captures its essence using textures, shapes, colour and organic forms. Each piece is unique and will transform any wall space. She believes in the quotation “Life is a blank canvas and you need to throw all the paint on it you can” and continues to explore new pathways.